Any summer BBQ is sure to benefit from these adorable Fruit Salad Coasters. With one coaster representing each of the major summer fruits, these delicious felt coasters are sure to spark up an appetite! 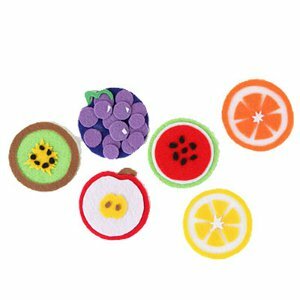 The great thing about these Fruit Salad Coasters is that they make great felt crafts for kids. Easy and fun to assemble, these soft coasters are really easy to make and could easily be assembled before a last minute outdoor summer party. Cut out patterns for each fruit coaster. Lightly trace the base (Pattern A) on red felt; cut out. Trace Pattern B onto white felt and cut out. Cut a slight divot at top of the red and white pieces. Center the white piece onto the red base and glue in place with Original Tacky Glue. Trace and cut center (core) from yellow felt and glue in center. Cut out seeds from brown felt and glue onto yellow core piece as shown. Cut stem from brown felt and glue one end on the back top edge of coaster and hook over to the front of apple. Trace base (Pattern A) design on Brown felt and cut out. Trace inner circle (Pattern B) on lime felt and cut out. Glue onto the brown base. Cut out the jagged center piece from yellow felt and glue on center of lime felt piece. Cut out small seeds from black felt and glue in place on yellow center. Trace base (Pattern A) onto orange felt and cut out. Trace inner circle (Pattern B) on white felt then cut out. Glue onto orange base. Cut six triangles from orange felt, position on center of white piece as shown and glue in place. Cut out a small jagged piece from white felt and glue in center where triangle tips meet. Trace base (Pattern A) onto lime felt and cut out. Trace and cut rind section (Pattern B) from white felt and glue to lime base. Use Pattern C to trace and cut melon center from red felt and glue onto center of white rind section. Cut seeds from black felt and glue in center of red felt as shown. Trace base (Pattern A) onto dark blue felt and cut out. Cut slight divot at the top as done with the apple. Trace grape pattern on purple felt (enough to cover dark blue base plus a few extra for layering). Cut out. Position and glue larger grapes on base. Glue smaller grapes randomly on top of the larger ones, being careful to keep the top level. Cut out several tiny pieces from white felt for grape highlights and glue in place on some of the grapes as shown. Cut out stem from lime felt. Glue one end to backside along the top edge and place the other end over to the front, overlapping a grape. Glue in place.